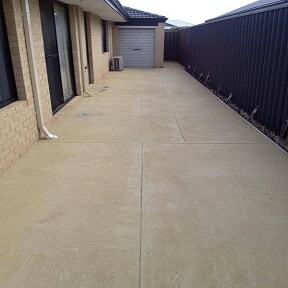 Concrete Laying is the process of making massive or depending on the size of the surface, new concrete slabs. The method includes the 1 part cement mixing with 2 part sand and 4 part course with water aggregate to form a concrete slab. The mixture needs to mix on a clean and flat surface. 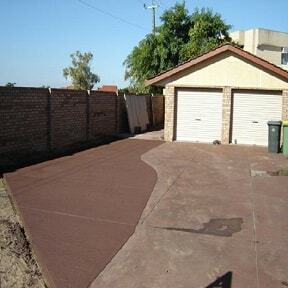 Preparation includes cleaning the area in which the pouring has to be done, all the restricting objects such grass, shrubs or even old concrete should be removed, the sub-base or material on the cement will rest should be prepared, generally, a granule fill or a road base is preferred. Our professionals use closed-grade fine-grade stone or open-graded stone for their sub base. The thickness of the sub-base depends on the materials used. It is of 4-6 inches. Also, the area should be fenced with a wooden or steel perimeter secured with screws which will help in labelling and to acquire the finish. In this process, at first, the cement mixture is prepared by mixing 1 part cement 2 part sand and 4 part coarse with water to bind all the components. We have some specific tools & machines for mixing this mixture to save time n to produce a smooth cement mixture. The mixture is then poured into moulds, or the fenced area which is made with wooden perimeters along with the mixture is spread in the whole area and smoothed out which specific tools. After this, the broom pattern is created to make a slip-free surface or a trowel finish which is smooth surface but with designs on it. Also, as soon as the concrete mixture is poured, it should be sealed which helps the concrete to cure, avoiding cracks and discolouration. This mixture is now left for 28 days to heal. Regular cleaning with soap and water maintenance would help in keeping the concrete will provide its best appearance, and also occasional seals (~ every five years) would benefit in avoiding the concrete from getting snafued through use. Here one question can arise why do we need professionals for doing this since we already have described the process? Also, may think there are 100s of DIY articles on the internet regarding this process, we don’t need professionals. The answer for this very simple, we are professionals with lots of experience, hiring us would certainly minimise the risk of any faults, injuries or any hassles. Plus with the professionals, you’ll get the quality without errors.